The Project Fi app for users of the Google’s MVNO has been updated and it brings a great new feature: Multiple voicemail messages. 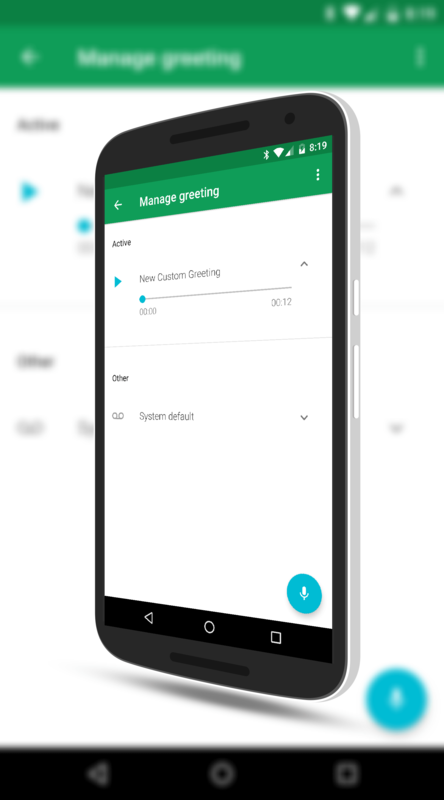 Now you can record multiple greeting for your voicemail on the service and select which one you want to use for a particular day or event. The update comes as version is G.1.7.16 for those keeping score at home and it is in the Google Play Store now. You likely have already received an OTA update for it but if not, it will be there in a day or two. You will know that you have the update when you go into the app, scroll down to Voicemail then tap on Manage greeting. You will see a blue microphone icon at the bottom of the screen which you can tap (and my be prompted for microphone permissions) to record a new greeting. Once you do, you can name it and it will be saved to your account. One thing to be clear on about this new feature. It does not give you the ability to set a voicemail message per caller. It is system wide. Some Unified Communications (UC) solutions allow you to set up a different voicemail for different callers (which you define). This ability to record multiple voicemail messages in Project Fi is just to have different messages available but only one is played to all callers when it is set to default. Even if you are not a Project Fi customer you can download the app and you can download it to any Android device. However it really won’t do you any good unless you are a subscriber. You can sign up at http://fi.google.com or get more information. If you are curious about Project Fi, you can read my review and experience with the service here on the site.